Kill Bill director Quentin Tarantino has announced his next project will be a kung-fu film shot in Mandarin. He will also shoot a second version of the film, dubbed with a deliberately out-of-synch English soundtrack. "I enjoyed shooting all the Japanese stuff in Kill Bill, so much so that this whole film will be entirely in Mandarin," Tarantino told Total Film. "If you're not up to watching it with subtitles, I really want to do a full-on dubbed version," he added. "Maybe shooting two Kill Bill movies has spoiled me." At a press conference in April this year, the director had intimated that his next project would be the World War II film Inglorious Bastards. But he told Total Film magazine's editor, Mark Dinning, that his homage to cult 1967 action film The Dirty Dozen would have to wait a little longer. 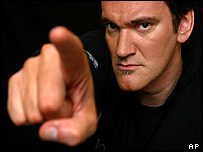 "Everyone still thinks I'm doing Inglorious Bastards next, but before I do that I want to do something much smaller," said Tarantino, whose films have included Reservoir Dogs and Pulp Fiction. The director did not offer any further details as to release date, plot details or cast on the untitled project. "He just wants to make a genuine martial arts film with all the ideas he has spilling over from shooting Kill Bill," said Mr Dinning. "His new kung-fu project has Tarantino written all over it - a mix of the barmy and the brilliant that film fans will be excited about seeing."